Categories: God, Theology, Westminster Shorter Catechism, Westminster Standards | Tags: God, Westminster Shorter Catechism | Permalink. *1 Psalm 86:9; Isaiah 60:21; Romans 11:36; 1 Corinthians 6:20; 10:31; Revelation 4:11. *2 Psalm 16:5-11; Psalm 144:15; Isaiah 12:2; Luke 2:10; Philippians 4:4; Revelation 21:3-4. Categories: Christian Freedom, Theology, Westminster Shorter Catechism, Westminster Standards | Tags: Christian Freedom, Westminster Shorter Catechism | Permalink. Ray Ortlund has posted the often shared story of two men who meet in mayhem and recognise they have something in common. It’s always someone’s first time reading this, so here it is again. Categories: Christian Freedom, Christian Growth, Westminster Shorter Catechism, Westminster Standards | Permalink. What does The Creedal Imperative (Carl Trueman, Crossway, 2012) promise? In six succinct chapters, Carl Trueman: outlines the current cultural trends which deter people from confessionalism; outlays a biblical case for creeds and confessions; recounts the way creeds and confessions were (and remain) indispensable formularies in combating theological errors in early church history; overviews four major reformation era protestant confessional standards; demonstrates the roles creeds and confessions play in Christian praise and spiritual growth; and concludes by highlighting how creeds and confessions regulate and balance healthy church life and structure. I started reading this as a committed confessional. That said Trueman opened up various tangents that I found refreshing. It was good to be reminded of biblical examples of summary statements of biblical teaching, forms of sound words or confessions being encouraged upon the early church. The notion that a church or Christian who claims ‘no creed but the Bible’ is bound to revisit every theological and christological controversy of the early church, but without the terminologies and formulations which the church expressed in creedal and confessional standards should prove very daunting. So much of the effect of creeds is woven into Christianity that most Christians outside of the creedal tradition don’t even recognise their effect. The chapter dealing with Confession As Praise is particularly practical as it seeks to remind us that the statement Jesus Is Lord is both confession and exultation, and, rather than being elements of formalism, creeds focus on God and his nature and works, which when rightly considered promote praise. What I’m not sure about. Personally, the contrasting of creedal and confessional material in corporate worship with the content of songs was intriguing. I have to confess a preparedness to adopt and use songs based on our own congregational discernment, as do most churches these days. The concept that our songs are sung creeds or confessional statements is something that I’m thinking about as I select them and think about their role in our worship and what that means for our links with our denominational family. It would also be interesting to read expanded evaluation about the subject of rewriting or revising creeds or how contemporary formulations such as the one recently completed by scholars associated with the World Reformed Fellowship, or the Belhar Confession fit into contemporary church life. The Creedal Imperative is an insightful introduction to the place of Creeds and Confessions in the life of the church for those who have not encountered such formulations, and a refreshing invitation for those of us committed to their use to ensure that their full value is realised in our church worship and life. 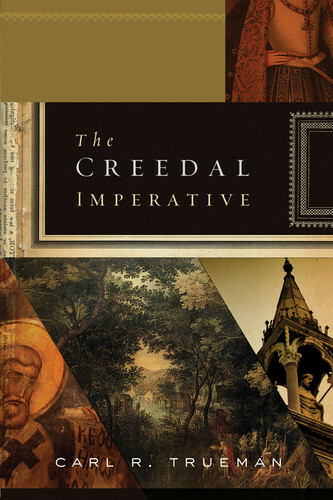 The pdf review copy of The Creedal Imperative was provided by Crossway Publishing as part of their blog review program. Provision of the book did not require the publication of a positive review. Categories: Book Reviews, Books, Church History, Doctrine, Theology, Westminster Standards | Permalink. Q What special act of providence did God exercise towards man in the estate wherein he was created? *1 Genesis 2:16-17; James 2:10. Categories: Biblical Theology, Creation, Theology, Westminster Standards | Permalink. Q What rule has God given to direct us how we may glorify and enjoy him? *2 Deuteronomy 4:2; Psalm 19:7-11; Isaiah 8:20; John 15:11; John 20:30-31; Acts 17:11; 2 Timothy 3:15-17;1 John 1:4. Q What do the Scriptures principally teach? *3 Genesis 1:1; John 20:31; Romans 10:17; 2 Timothy 3:15. *4 Deuteronomy 10:12-13; Joshua 1:8; Psalm 119:105; Micah 6:8; 2 Timothy 3:16-17. Categories: Scripture, Theology, Westminster Shorter Catechism, Westminster Standards | Permalink. Categories: 1, Christian Freedom, Theology, Westminster Shorter Catechism, Westminster Standards | Permalink.